My daughter is cranky today. This is worth noting because, much like her father, Jane has a complete inability to hold a grudge or stay angry for any period of time. I, however, am perfectly capable of holding a grudge long enough to forget a person’s facial features but I can easily recall the slight. I’m not proud of this. It’s just the way we’re made. So when I pick up a stressed out and unhappy kid from school I was surprised and unprepared. Alexander and I are walking on eggshells, she’s sitting next to me now scowling a bit and refreshing her email every few seconds. Today is the day that the high school acceptance letters are put in the mail. Last Friday was the day for the parochial schools and today is the day for the secular schools and my daughter is freaking out more than a little. She applied to one Catholic School and was accepted there. It’s a great school, she and I both love it (Mr. G is lukewarm) but it’s not her first choice. Last Friday at promptly 3pm I got an email from Notre Dame congratulating Jane on her acceptance. The following day an admissions packet was sent to my mother’s house (we’d had that bit of mail forwarded to where the kids were staying) and tomorrow is an orientation day (which is code for get your checkbooks out). Of course we’re supposed to be at that school first thing in the morning tomorrow but the mail arrives around 12.30 which will let Jane know what other schools she’s been accepted to and there’s the whole issue of being in two places at once. And we were all silent. Both of my kids were miserable and I wanted to punish my daughter and hug her at the same moment. Alexander and I are doing our best to avoid her now and she’s just asked if we can have dinner at Sugarfish. I said no but missed the moment when I didn’t finish the sentence with… because I’m not spending $150 to have sushi with you when you’re nasty. I guess a good bit of parenting involves missing the moment. It’s a good thing I’ve got a few more years to get that right. It occurred to me just moments ago that I have a celebration plan. We’ll have a nice dinner somewhere (probably Sugarfish or Katsuya) and then we’ll buy her a sweatshirt from whatever high school she decides to attend. I had not even thought of the fact that she might only get into one school. I have no plan that involves disappointment. I’m not the most optimistic woman in the world but I’m not a pessimist either. I just see my kids and I see perfection so I assume the rest of the world will too. This is probably not a realistic manner in which to approach the world. 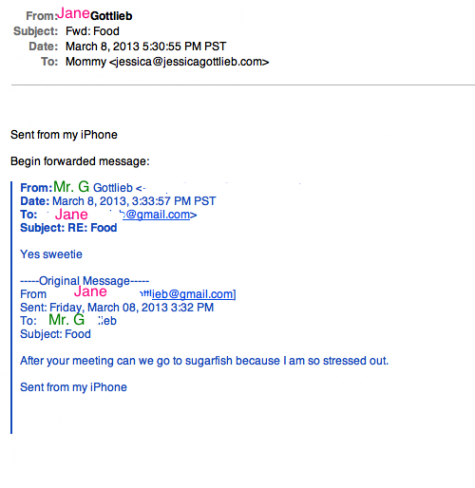 So 3pm has come and gone and Jane and I are silently thinking that the lack of emails mean non-acceptance. When 5pm and 6pm pass and there are no emails I’m assuming that our anxiety levels will soar. How do I parent her through this one? What if her first choice school doesn’t see her as their first choice? Do I pretend to be okay with it? What if no one emails and we actually have to wait until tomorrow afternoon? Will my heart hold out? This is not the part of parenting that I’m good at. It’s a good thing someone sent me Kinderchocolate. I’m about to bury my face in it so that my daughter can learn some real coping skills. Oh, that is awful. I’m crossing my fingers for her and you. However, if disappointment happens then I know you will find a way to help her through it and maybe this will propel her to work even harder to her goal for college. No consolation now. Hopefully the chocolate helps. And maybe you can mope with her a bit, go see a good movie, and then drag yourselves out to something fun tomorrow night. Invite her girlfriends over or something.